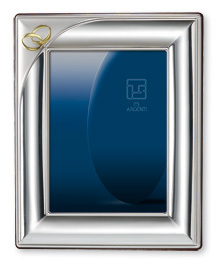 Very elegant picture frame made .925 sterling silver gloss and matt accentuated with two entwined gold rings (made from real gold). Inner size is 7" x 9.5" but will fit a 8" x 10" photo. The back is made from solid mahogany wood. The perfect gift that will last for generations! Reward Points 139 points will be rewarded to you when you buy this item.